RR Phantom Cars knows nothing quite tops gliding to your special event in a gleaming Rolls-Royce or Bentley luxury car. Heads turn and onlookers watch in delight, wondering who might be snugly tucked inside this gorgeous carriage. Perhaps a beautiful bride wrapped in luxury and blissful anticipation of her wedding day or maybe a happy couple being whisked away to their honeymoon, already begun in the elegant privacy of our grand cars. The art of a wedding lies in successful planning, with RR Phantom Cars wedding car hire is an element that you will not need to worry about. Our highly experienced team are able to understand and cater to every type of ceremony and wedding and can deliver exactly what you require. RR Phantom Cars specialises in providing Rolls-Royce and Bentley luxury cars for wedding car hire. We have a spectacular range of stunning vehicles to ensure you travel to your wedding or event in style, elegance and class. The sheer prestige and outright glamour of the Rolls-Royce Phantom makes it the perfect vehicle of choice. RR Phantom Cars maintains a fleet of Phantoms that offers you perfection ranging from the glistening white exterior with a choice of theatre style seating to your very own custom bar. For a dramatic yet graceful presence, the Rolls-Royce Ghost is the luxury car for you. RR Phantom Cars presents you with a bespoke red interior set against a striking wenge dashboard. 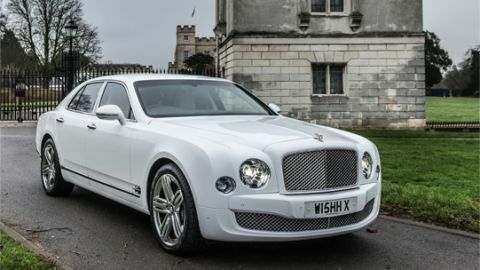 If you are looking for a powerful and luxurious chauffeur driven experience, step inside our lavish Bentley Mulsanne. Enjoy the hand stitched leather massage seating and top of the range Naim entertainment system on your journey. We cater to every style of wedding and our professional chauffeurs are on hand to provide you with an excellent, seamless service for your picture perfect wedding day. Step on board with RR Phantom Cars and enjoy the journey to one of the most momentous days of your life.